Roller chassis are a storage system for canned small-size goods, intended for high-frequency picking operations. The solution of Roller chassis is typically used for warehouses having a high turnover of goods, a high number of items to be managed and, at the same time, a small quantity of goods to be picked up. It is suitable for storage with the FiFo (First in - First out) and LiFo (Last in - First out) logic. It is appreciated in working environments following the logic of "lean manufacturing" thanks to its efficiency and simplicity. Like all the other solutions, Roller chassis use the force of gravity to guarantee the constant presence of goods on the load front, thus providing for a considerable saving of energy, space and resources in use. They can reduce the time necessary to prepare and execute orders, thus decreasing the possibility of human error and facilitating the operations for controlling and managing stocks. The fixed-joint assembly ensures easy installation, thus limiting the need for screws and assembly tools. 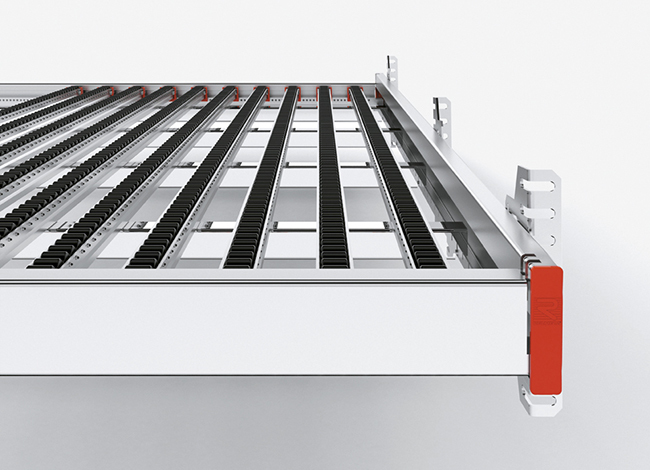 Roller chassis can be installed on all types of racks thanks to universal connectors. The modularity of Roller chassis offers a countless number of product configurations and an efficient customisation for all storage needs in any industrial sector. The product can be easily built in already existing plants and it can be combined with other solutions of the Rulmeca Dynamic Warehouse line.